A beautiful spring wedding at Cheers Chalet. Spring flowers and red bud trees were in full bloom, with grass as green as the hills in Ireland on a spring day. 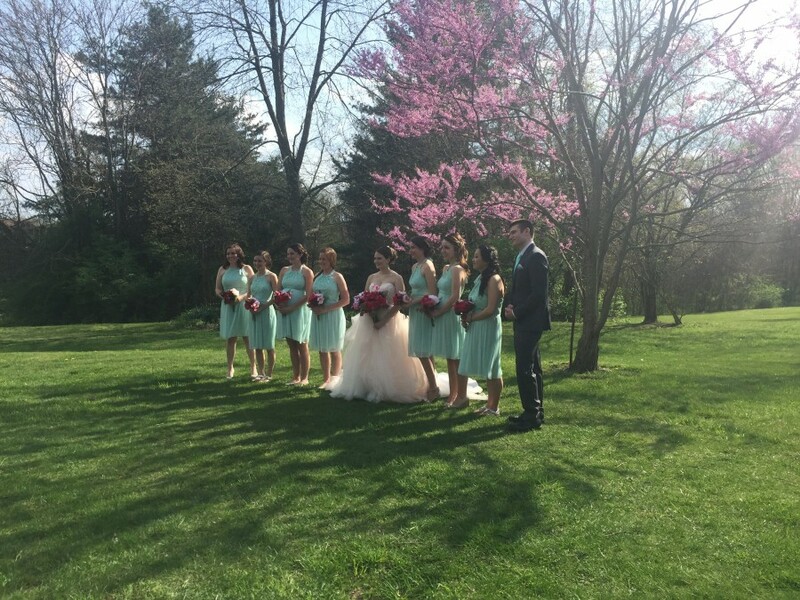 The bride was beautiful and dressed in a blush gown, her attendants were dressed in a beautiful shade of mint green. The groom and and groomsmen were in formal black and white. It was a perfectly beautiful day for a spring outdoor wedding in the Cheers gazebo. The room was decorated in spring shades of mint and blush. There were 125 guests in attendance. Creative Executive Catering, Cheers own catering company, catered the evenings selected menu. The couple chose our fire roasted whole hog roast with special BBQ and horseradish sauce…carved by our chef and served to the guests with a spring garden salad, homemade dinner rolls, Au gratin potatoes, Cole slaw, country style green beans. They chose a hosted beer and wine bar. « Prom Season is Here!